During the Troubles in Northern Ireland, the Ulster Volunteer Force murdered more than 500 people. The loyalist paramilitary group's campaign also claimed the lives of 33 people in bomb attacks in Dublin and Monaghan in 1974. The UVF was formed in 1966 to combat what it saw as a rise in Irish nationalism centred on the 50th anniversary of the 1916 Easter Rising. It adopted the name and symbols of the original UVF, the movement founded in 1912 by Sir Edward Carson to fight against Home Rule. Many UVF men joined the 36th Ulster Division of the British Army and died in large numbers during the Battle of the Somme in July 1916. Fifty years later, the Prime Minister of Northern Ireland, Captain Terence O'Neill, would rush back from a commemorative service at the Somme to ban the UVF. It had been formed a few months earlier with the express intention of executing "mercilessly and without hesitation" known IRA men. Their first three victims, a Protestant woman and two Catholic men, had no connections with the IRA. It was the murder of barman Peter Ward, the third victim, which brought the UVF and its leader Gusty Spence to public attention. Spence was convicted of Ward's murder and sentenced to 20 years in prison. The new UVF opposed the liberal reforms being introduced by PM O'Neill. In March and April 1969 they bombed water and electricity installations as part of a broader political campaign to force O'Neill to resign. The bombings were blamed on the IRA. O'Neill resigned at the end of April. According to the book Lost Lives, between 1966 and 1999 the UVF and an affiliate group, the Red Hand Commando, killed 547 people. Many were killed in high-profile attacks. In December 1971 they planted a bomb at McGurk's bar in Belfast killing 15. By the mid-1970s a vicious UVF unit known as the Shankill Butchers was engaged in horrific sectarian killings. In May 1974, the UVF was suspected of planting bombs in Dublin and Monaghan killing 33 people and in 1975 they shot dead three members of the Miami Show Band. In October 1975, the UVF was undermined when soldiers and police swooped on houses in Belfast and East Antrim and arrested 26 men. The following March they were sentenced to a total of 700 years in prison. The police got more evidence in 1983 when a UVF commander turned informer. In October 1994, the Combined Loyalist Military Command, which included the UVF, called a ceasefire. Gusty Spence made the announcement, expressing "abject and true remorse" to all innocent victims of loyalist violence. The UVF's political wing, the Progressive Unionist Party, played a prominent role in the peace process and supported the 1998 Belfast Agreement. 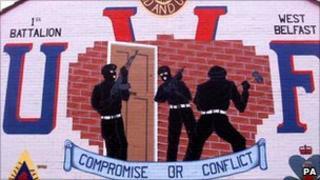 Since 1996, the UVF has been embroiled in a feud with the Loyalist Volunteer Force. In August 2000 a murderous feud broke out between the UVF and the UDA's C Company, led by Johnny Adair, on Belfast's lower Shankill Road. By the time a truce was negotiated in December 2000, seven men had died as a result of the feud and hundreds of families were displaced. In 2007 the organisation declared that it was renouncing violence. In June 2009, it decommissioned weapons as witnessed by the Independent International Commission on Decommissioning (IICD) led by General John de Chastelain. On 28 May 2010 Loyalist Bobby Moffett, 43, was shot dead on the Shankill Road, in Belfast. The Independent Monitoring Commission (IMC) said it had been a "public execution" sanctioned by UVF leaders. In its report IMC said the UVF could have prevented the murder but did not. Mr Moffett was perceived to have flouted UVF authority, the report said. The IMC concluded: "The murder represents a serious backward step after a period when all paramilitary groups other than dissident republicans had moved decisively away from violence." However, the IMC said it hoped the incident was a one-off, and the report did not recommend any sanctions against the UVF or its political wing, the Progressive Unionist Party (PUP). In June 2010 the leader of the Progressive Unionist Party, Dawn Purvis, resigned from the party. She said she was leaving because the PUP was "severely restricted because of its relationship with the Ulster Volunteer Force". It followed controversy over the shooting of loyalist Moffett which has been blamed on members of the UVF. On June 2011 one of the worst nights of rioting East Belfast had seen in years took place. Trouble erupted after a group of masked loyalists wearing surgical gloves attacked catholic homes on the Mountpottinger Road end of Short Strand. A press photographer was shot and several other men were injured. It is believed trouble was sparked by a number of factors. Some loyalists had felt that they had been unfairly targeted by the Historical Enquiries Team (HET) in a series of investigations into murders during the troubles. Some loyalists have also been angered by restrictions placed on a number of parades, including a parade in east Belfast in recent weeks. But the main catalyst is believed to be a power struggle between the UVF leadership in east Belfast and the rest of the organisations leadership.